InEarZ™ Custom Professional Musician Monitor earphones are not just beautiful with magnificent sound, but because they are still a boutique brand that is not widely known, InEarZ™ offers top quality monitors at an uncommonly low price. Check out the professionals who use InEarz! InEarZ™ offers six models, beginning with the IE150 with single balanced armature drivers, all the way up to the IE850 professional model with a staggering Eight drivers in each ear! Below you will find a detailed summary of all the models in the InEarZ™ lineup, followed by individual listings that give details on each model, including pricing and a link to choose your options and place your order. Questions? Drop us an email custom@earplugstore.com or give us a call during business hours: 918-478-5500. Whether you are a professional musician just starting out on a budget, a seasoned veteran of the rock wars with all the money you need, or a serious music lover looking for a no-compromise set of in-ear monitor earphones, we invite you to explore this exciting new entry into the field of professional music monitors, for the simple pleasure of music the way you crave to hear it, and at amazing prices! The InEarZ™ professional series includes six models. All models include the features and options below, with the primary difference being the number of drivers in each ear. Obviously the more drivers in each ear, the better the sound quality will be since each driver can be selected to perform a more specialized job, yielding better sound overall. Each InEarZ™ model is carefully designed to provide the cleanest, clearest sound possible, given the number of drivers and their specific configuration. The objective in every InEarZ™ model is to produce accurate mids and highs as well as rich and powerful bass when the music calls for it. 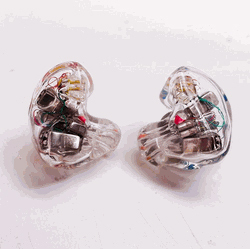 Top quality balanced armature drivers for clear, powerful music. Wide range of beautiful earpiece colors from which to choose. Durable twisted wire cables that plug into the earpieces. Wire uppers feature a moldable section for secure placement around the ear. Wire lower is equipped with a 90 degree 3.5mm standard stereo plug with rugged strain relief where wire attaches to plug. Five color choices. Each InEarZ™ monitor ships with a sturdy watertight pelican style case, cleaning tool and twisted wire cable. Warranty: 90 day fit warranty. 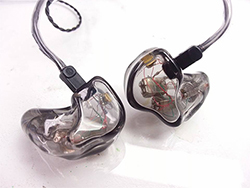 If your custom InEarZ™ do not fit properly, we will adjust or remake your earpieces as needed. One year warranty against defects in materials and workmanship. The warranty does not include cables, or physical damage to earpieces. InEarZ™ IE-P150 is the entry level model in the InEarZ™ professional series with one balanced armature driver in each earpiece. InEarZ™ IE-P250 is an excellent monitor for the working musician on a budget, with dual drivers providing pro level sound. InEarZ™ IE-P350 is an ideal choice for the professional musician seeking an accurate music rendering across all frequencies. InEarZ™ IE-P450 is an excellent mid priced monitor for those who want more bass response in addition to clear mids and highs. InEarZ™ IE-P650 provides the demanding professional with a pure musical experience across the frequency range, with no compromises. InEarZ™ IE-P850 gives the demanding professional everything he might want plus enhanced bass response. There is simply nothing like it. InEarz Zen 2 Universal Fit In-Ear Musician Monitor Earphones provide stunning clarity via dual balanced armature drivers in a robust single bore shell. Now you can get InEarz bleeding-edge ADEL™ Technology in a universal fit model that is ready to bring you clear, memorable, satisfying sound right off the shelf. InEarZ™ IE-P150: InEarZ™ IE-P150 is the entry level model in the InEarZ™ professional series with one balanced armature driver in each earpiece. InEarZ™ IE-P250: InEarZ™ IE-P250 is an excellent monitor for the working musician on a budget, with dual drivers providing pro level sound. InEarZ™ IE-P350: InEarZ™ IE-P350 is an ideal choice for the professional musician seeking an accurate music rendering across all frequencies. InEarZ™ IE-P450: InEarZ™ IE-P450 is an excellent mid priced monitor for those who want more bass response in addition to clear mids and highs. InEarZ™ IE-P650: InEarZ™ IE-P650 provides the demanding professional with a pure musical experience across the frequency range, with no compromises. InEarZ™ IE-P850: InEarZ™ IE-P850 gives the demanding professional everything he might want plus enhanced bass response. There is simply nothing like it.